Yes, I said the “f” word – the one that gets more attention than the other “f” word. I admit it, I spend waaaayyy too much time looking through trash in search of treasure. Does it pay off? Certainly. And this time, I’m doing it for you. We’re talkin’ FREE stuff, people! No buyer’s remorse! Craigslist is a beast. It’s a necessary tool for many in search of the perfect rental, job, boyfriend, girlfriend, concert tickets, piece of used furniture, car, one-time-date (yes, I know someone who has done this and it wasn’t me)…..you can find almost anything on the site. 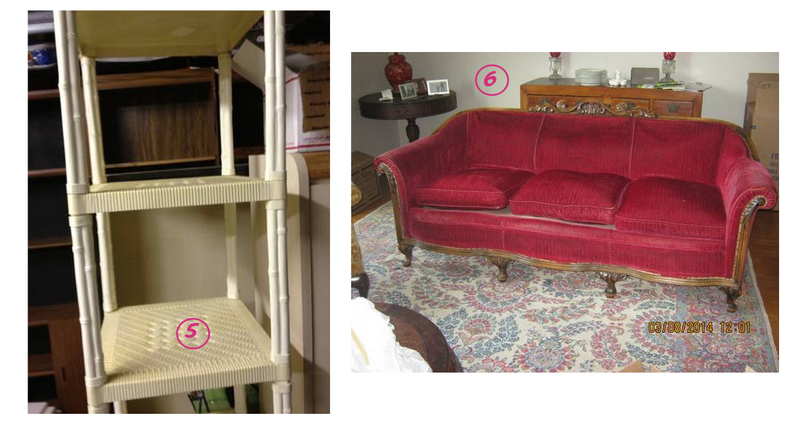 I have a preference for finding free items ripe for restoring or up cycling. So here are my latest finds for you, Bay Area. 1. Blue velour couch And I *just* wrote about my weakness for blue velvet couches. This one is tufted, a little 80’s (you guys, this era is making a HUGE comeback), and a lot FAB. Hello? Why can’t I have you? I emailed the owner who said that there’s a slight tear in the back and a faded out spot, also in the back. 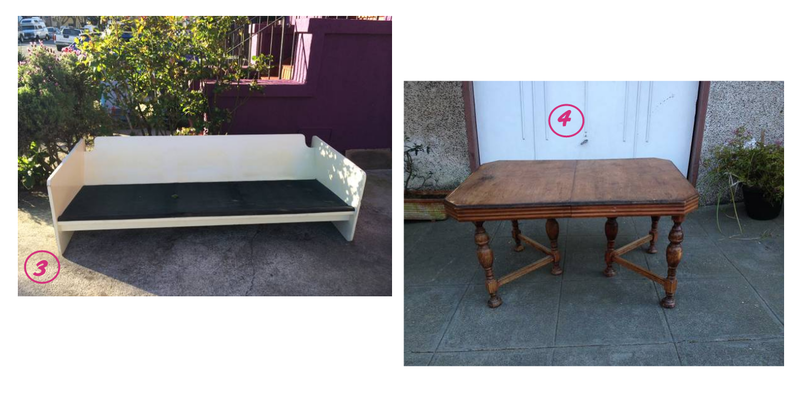 If this couch can be placed against a wall, back unseen, it’s a total score. Somebody needs to get eeeeet! 2. Danish inspired office chairs. I want these. They are in great shape and waiting for some lucky owner in the SOMA neighborhood. They also have tufting, which I find hot. 3. Couch frame. This is so Paul Frankl it’s not even funny. Paint it in a funky turquoise or aqua and throw black cushions on it. Deco dy-no-mite. 4. Antique table. Some TLC and it’s good to go. Modernize it by painting it glossy white and teaming it with Eames dining chairs in a bright orange. (Pssst…you don’t have to get originals. There are knock offs for about $100 each.) WIN. 5. Faux bamboo shelf. Faux bamboo is fauxbulous right now. I’d get a can of gold spray paint and glitter it out. 6. Red velvet couch. Are you kidding me? It’s a red velvet couch for FREE. You can’t see me, but I’m sobbing right now. 7. Set of 4 40’s dining chairs. Count ’em, 4 chairs y’all! 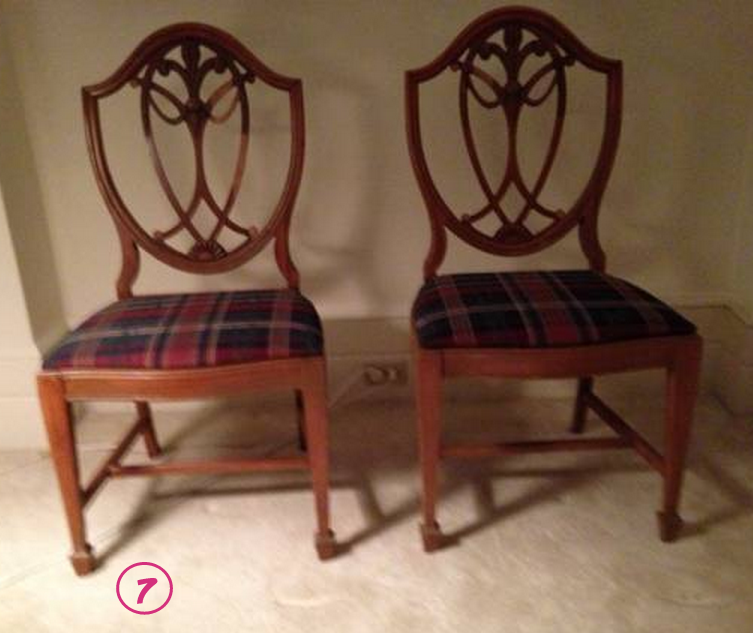 2 have arms, 2 are side chairs. Cover them in a black and white striped fabric, paint the chairs black, paint them yellow, refinish the original wood and cover them in a yellow chevron fabric….the possibilities are ENDLESS because they are FREE. I wish I had the vision that you do. You amaze me. Thank you for taking the time to write your blogs. I’m forwarding then to waky. Thank YOU for taking the time to read my blog! I really appreciate it! Yes, definitely forward to Waky. I’d love for her to see these!